The end of my time with Ducati’s Monster means thinking back over the year to form some conclusions about the bike. And the moment I keep coming back to is not a sunny rideout or moment of dreamy contemplation in the garage. It’s a telephone conversation I had with an MCN reader in late summer. He was considering trading his Honda Fireblade in for a Monster 1200 and was looking for some advice on what the Ducati was like. I remember the conversation so well because it boiled my thoughts on the Monster down to their essence. The guy wanted a bike that was more pillion-friendly than his Blade, and more suited to longer journeys that possibly branched out into Europe. He was 6ft 2in and was looking to take his partner on the back more regularly, but still wanted some sporty ability and *definitely* didn’t want an adventure bike. Normally when someone calls for advice on whether they should buy a bike, the answer is yes. If they’ve reached the point of calling someone, they want the bike and are looking for affirmation of the decision they’ve made. We all buy bikes mostly with our heart, with the requirements of the head usually a fairly distant second. But this time I couldn’t outright say ‘yes’. 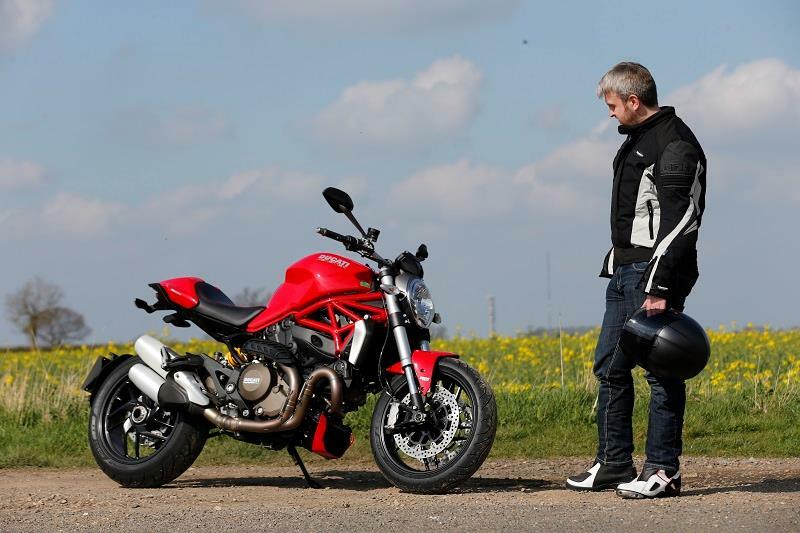 Having tested out the pillion potential and found it lacking, and having suffered aching limbs when riding to Italy and back for World Ducati Week, I didn’t feel the Monster 1200 was the bike for him. The riding position is cramped for my 5ft 10in frame, let alone the reader’s six feet and two inches, and space for luggage is limited – especially if the pillion seat is already occupied. His aim for a sporty bike is better served by the Monster, but only to a degree. A trackday at Cadwell Park this year could have quickly become frustrating, thanks to limited room for a foot on the right peg, and a rearward weight bias that left me struggling for feel from the front end. There are areas where the Monster is great. If someone had called, looking for a brilliant looker that will make sunny weekends seem even brighter, had arm-popping acceleration and could deftly tackle sweeping bends then the Ducati would have received a resounding thumbs-up. But I felt I had to make the caller aware that I felt the bike wasn’t what he was looking for. He said he’s been offered a cracking trade-in price on his Blade and I could tell he was torn. It was obvious he really had been looking for me to say ‘yes, go for it’. I don’t know if he went on to buy the Monster. If he did, and I suspect he would have done, I genuinely hope his heartfelt decision is working out for him. But, for me, the Monster was not versatile enough to put ticks in the boxes he wanted filling.